I have seen a few Cicada Killers and they have been building burrows around some new flowering shrubs I planted this spring...this is the first time I saw one with a Cicada. Thanks for the cool photos of an Eastern Cicada Killer female with cicada prey. I can tell you that the cicada specimen is a female and while there isn't a view of the cicada from the top(dorsal view). I am going to guess that this may be the species of cicada known as Tibicen superbus. Thanks for sharing these very cool photos. 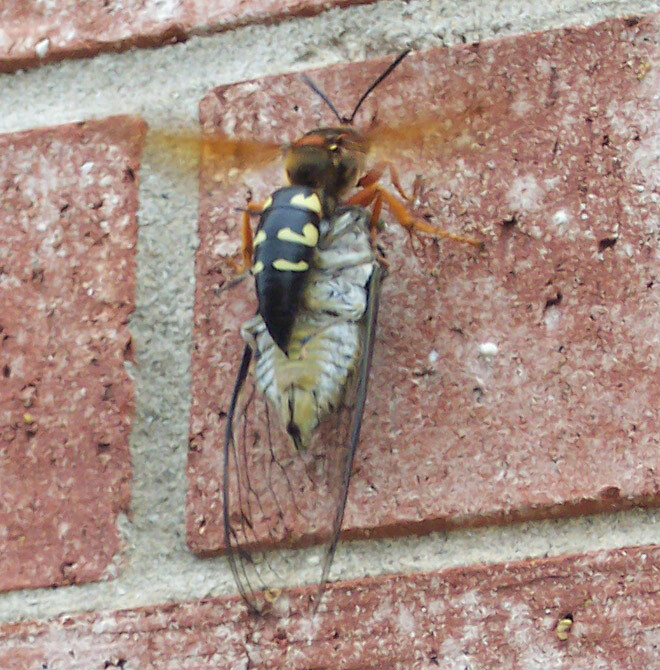 That's a pretty big cicada relative to the wasp. Many of the western (Texas) Tibicens are slightly smaller. By comparison, the wing pattern & coloration don't seem to agree with a fresh T. superbus. 3) + overall size by comparison with the wasp seems off for superbus (T. superbus is slightly larger than coastal T. davisi and ~equal in length to most cicada killers). Regarding Tibicen species recorded from that region, it is more consistent with T. resh in size + the "Z" infuscation in the forewing agrees with that species (in contrast with dealbatus or pronotalis neither of which possess a well developed "Z" in the forewing). However, as per our conversation the other night, I'm in 100% agreement withyou and don't think it's a "Magatibicen" either. I looked through my Texas examples of Quesada - all of which are slightly smaller than are those I have from Mexico & Guatemala, but by comparison bigger than most Tibicens ... and comparable in size when placed next to an eastern Cicada killer of average size. The length (by comparison to the wasp), wing shape/pattern (long sharp wings with a well developed "Z"), shape of the abdomen (wide & squat / it's strangely short and wide - like a female Quesada) and the ventral coloration & aspects are also consistent with Quesada. I found a map showing this species has in recent years been seen in and around San Antonio, so it's not out of the question as an option. My only concern at the time of our conversation was wondering if Sphecius did indeed take Q. gigas. I got hold of Chuck Holliday's "Cicada prey of New World Cicada Killers" published in 2009 and apparently Sphecius does indeed take Quesada. Based on that paper and your keen I I have a tendency to agree with that ID. Thanks much. Glad to see that Q. gigas is listed and confirmed as prey; helps narrow the potential id a bit. I still need to familiarize myself with several of the TX Tibcen & Diceroprocta species (many are small and "similar" in appearance). 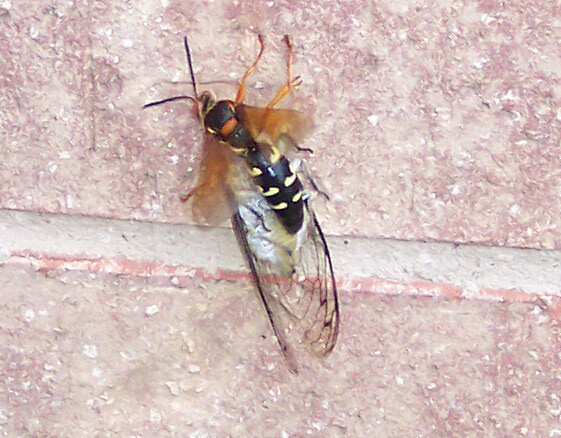 I'm interested to see what species show up as prey for Cicada Killers. I hear they take N. hieroglyphica, but I haven't yet seen that locally. My guess is that it's "a necessity thing - take what you can get ;)"
Hmmmm - Since we have so many midsized Tibicens locally, it probably isn't "energy/cost effective" for CK's to hunt the smaller species.